Genuine cowhide leather: brown, heavy duty, distressed, and reinforced with thick vinyl Quick-release, double buckle on each bag Easy-carry handle on each bag External Velcro-closure flap pocket Chrome-plated studs Zip-out connectors convert each bag into a perfect suitcase Measures of each bag: 15.5 inches in legth, 6.5 inches in width, 11 inches in h..
Material: Tough water and weather resistant Cordura nylon with PU Leather inserts.Constructed from rugged blend of fabric and leather-grained materials that looks grat on any type of motorcycleSpacious top-loading main compartment ( 11 inches deep ) large enough to hold one full-face helmet plus other cargoIncludes additional a zippered mesh pocket and Velcr.. Heavy duty, 2.5 mm genuine cowhide leatherMatt leather finishQuick-release, triple buckle on each bagSlanted design: fits great on motorcycles with exposed rear shocksHeat Protection panels on bottom of each bag to protect bags from the heat of the mufflersMeasures of each bag : 21inches in length, 6 inches in width, 13 inches in heightMeasures are approxima.. 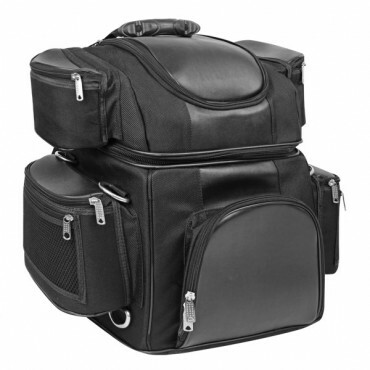 These saddlebags give you a nice classic look with sleek design- and chrome stud details you cant go wrong. The inside is lined with strong water resistant material to give extra durability. The bags can be zipped off for easy removal, there universal fitting with an expandable throw over- strap and extra tie down ribbon on each side for extra security. ..
Studded Flame Slanted SaddlebagsOuter Material: 100% Waterproof PVCBox lid closures with side Velcro accents to keep out the elementsChrome plated double brass buckles on each sideQuick-release buckles, hidden behind traditional chrome hardware, make opening the bag quick and easy Heat Resistant bottom panels to protect bags from hot exhaust pipes EZ..